You'll be £8.00 closer to your next £10.00 credit when you purchase The Roman Barbarian Wars. What's this? As Rome grew from a small city state to the mightiest empire of the west, her dominion was contested not only by the civilizations of the Mediterranean, but also by the ‘barbarians’ – the tribal peoples of Europe. The Celtic, the Spanish-Iberian and the Germanic tribes lacked the pomp and grandeur of Rome, but they were fiercely proud of their freedom and gave birth to some of Rome’s greatest adversaries. Romans and barbarians, iron legions and wild tribesmen clashed in dramatic battles on whose fate hinged the existence of entire peoples and, at times, the future of Rome. 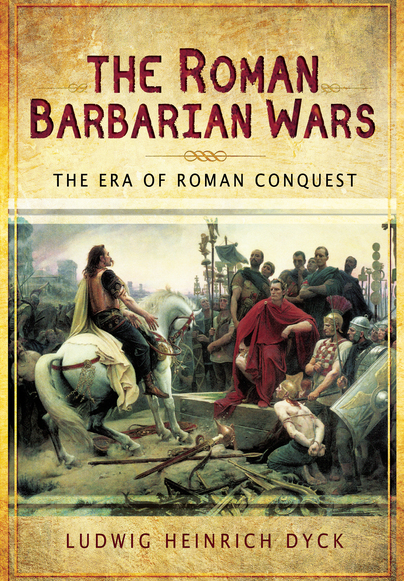 Far from reducing the legions and tribes to names and numbers, The Roman Barbarian Wars: The Era of Roman Conquest reveals how they fought and how they lived and what their world was like. Through his exhaustive research and lively text, Ludwig H. Dyck immerses the reader into the epic world of the Roman barbarian wars. This book is subtitled “The Era of Roman Conquest” and traces the history of the conflicts between the Romans and the various Barbarian tribes that occupied what is now Western Europe. I was pleasantly surprised that I enjoyed this book so much. I don’t usually venture into books about war but this one proved to be worth the effort. The author has thoroughly researched the period of the Barbarian wars and presents the chronology of the battles in an engaging way. The details of the battles are here, as much as we can know of them, and the politics of the time as well. This would be a good choice for those interested in Ancient History, Roman history, or military history. photos of sculpture and art, plus color illustrations and b&w maps. Reading this book I kept trying to decide what it was trying to do. Really I think it is trying to tell a story and give the reader a feel for the period and how the various battles and campaigns hung together. So whilst, for example, this wouldn't be the book I turned to if I wanted to refight a particular battle, it would be the book I turned to if I wanted to see the battle in context. Indeed it might be the book that convinced me a certain battle was worthy of being refought. The Roman Barbarian Wars: The Era of Roman Conquest by Ludwig Heinrich Dyck is not a historical novel, but an exhaustive study on one of the most interesting topics of the Roman Era: the Roman conquests. And, in particular, the Barbarian wars. Inside The Roman Barbarian Wars the reader has almost 240 pages full of pure Roman history, details and quotes, all mixed together and written with a perfect style, so even those who are not used to reading history books and prefer novels will be delighted with this exquisite narration. The story of Rome is often characterised through its struggles against the barbarian tribes of Europe, such as the Gauls, Germans, and Iberians. Although there is much more to Rome's story, these tales of barbarian conquest stand out due to their drama and ferocity. The so-called barbarians were capable opponents even to the well-organised Romans, belying their actual level of civilisation. Rome's legions did not venture forth without risk, despite the end result being the expansion of its empire. Each chapter of this book covers a different tribe, personality, or campaign. The author goes into great detail on each topic. His vivid prose makes for a gripping read. The reader can savour the chapters in a stand-alone fashion because of the way they cover different topics. On the whole, however, the book delivers on its promise to give the reader the big picture view of the conflicts between Rome and its barbarian foes. Spanish-Iberian and the Germanic tribes were defiantly proud of their freedom and became some of Rome’s fiercest adversaries. Roman legions and barbarian tribesmen clashed in dramatic battles on whose fate hinged the existence of entire peoples and – at times – the very future of Rome. The author demonstrates how the legions and tribes fought, how they lived and what their world was like. Also included are five maps, 16 colour and monochrome illustrations, text notes, notes on sources, a bibliography and an index. I was reminded, as I picked up this superb book, of that magnificent scene from Gladiator when they unleashed hell on the Barbarian hordes at the beginning of the film. Dyck has produced a book that celebrates the brilliance of the Roman commanders and of Rome itself from its foundation to its eventual demise. Superb. ... I found some interesting insight on some of the lesser discussed Barbarian wars, and I enjoyed reading about the famous story of Juno’s Geese saving Rome in chapter two, as well as the iconic quote “Woe to the Vanquished” in that same chapter. Overall it is an entertaining read, great for those wishing to cover some gaps in their knowledge of Republican Rome without pushing through a 1,000-page epic.